Each year we round up the B-Kyu places that have shut their doors. For those we loved thanks for the great food and those we missed out on visiting we are truly sad we never got there. It's always a sad trip we take at this time of year looking back on places that have closed. With all the hoohah for new places opening, we like to remember the ones that closed. The greatest loss this year had to be the Oceanic Cafe, a cafe on the east side of Central Station that you could safely say was iconic. This was one of those 'we really need to go back there soon' kind of places, its closure sparked off a flurry of revisits to favourite spots for us. We've mainly covered the areas we know well (Chinatown, southern CBD, Ultimo and Newtown) but if there are any other places you would like to remember, then please leave a comment. There's been considerable change in our beloved Chinatown this year. The building works on the corner of Dixon and Little Hay have made the central strip a little drab, a precursor to the major works due when the Entertainment Centre is pulled down in 2015 and construction begins on new apartment blocks. The Malaysians cleared out of Cafe Kasturi but It's Time For Thai, one of the only halal Thai places in the area, has made an excellent replacement. Malay Village closed their challenge to Mamak, it was briefly a Chinese hot pot resto but now is Korean BBQ. Nearby Supermeal on Goulburn Street was extensively renovated and has opened as Jiangnan. At the top end of Dixon Street Little Lamb and KoFoo Korean (soon to be Hawker by the Mamak team) closed. In the food courts, one of our favourite places in Eating World, Singapore Shiok, closed and reopened as the Thai stall Tiger Cave. At the Sussex Centre we lost Nasi House, North and South Cuisine and Wooree BBQ. Dixon House seemed to continue its woes with stalls opening and closing only a few months later, including Mother Thai, Just Thai, Shanghai Delicious House, Daily Fresh Hong Kong Dumplings and Mekong Eating House. Around the fringes were closures of Yummy Eight, Dim Sum Store on Little Hay, Cafe Nine (now Do Dee Paidang), Sydney Best Dim Sim, Gungho (now Yummy One), Charlie Lovetts, Coffee Boulevard and Dan's House. 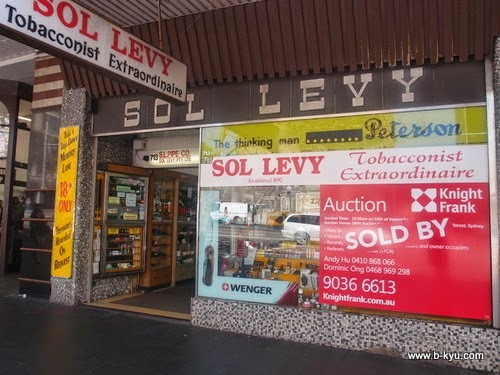 A non-food related victim of changing times, Sol Levy closed it's doors on George Street. Renovation is World Square saw Zozo Korean Restaurant close. Nearby one of our first forays into Korean dining, Hanabi, closed and has been replaced by ramen hot spot Yasaka. Laksa House in the Queen Victoria building has been replaced by Assam Thai Eating House, and Jaipur Sweets closed and moved to George Street as India Gate. Froyo joints closed as quickly as they sprung up (Snowpink and Moochi chains), and Michelle's Patisserie closed in the Hunter Connection. In Darlinghurst Cantina Mobile was replaced by Sumo Salad. Raquels, Oxford Social and Boom Banana closed. Anastasia's in Paddington, a long time resident, closed its red doors. There was considerable movement in Newtown, as rising rents forced out some players and reinvention was the name of the game. The froyo movement peaked with WowCow (now Whateley Lane Italian Eatery), Yogurtland (now Dumpling Hut) and Zwirl closing. The gelato wars continue. Cafes turned over at lightning speed, Fringe Cafe (now Cloud 9 Chocolate Cafe), Astinos became Spectrum and then Lattetude and is now Exotik Latin Cafe, the cafe opposite Urban Bites became the excellent Handcraft Coffee, Tango Flavours became Lentil As Anything, Cheeky Czech became Foodelicious, and Citrus is due to reopen as Urban Delights. Small bar Argee Bargee became Graze on King. M.O.A.N became Surprise became Goodfellas, now closed and nothing yet in its place. Deli on King is now clothes store The Social Outfit. Asian King reopened as Bite of China, Iiza Japanese Izakaya reopened as Wahoo Diner which didn't last long and is about to reopen as N2 Extreme Gelato. A favourite Korean lunch spot of ours in Paju BBQ closed, more Korean at Gokee Korean (ex-Ssam BBQ) also closed. Simply Noodles and New Taste are gone. The small fish 'n chip shop in southern King St became Izba Russian Delights, the strange corner spot that never quite worked (was Prasits, then seafood and briefly a rock n roll cafe) became Yenikoy Turkish. Janet's Pies reopened as Newtown Pies, Pie Face closed after the franchise went belly up and Dirty Dog Hot Dogs couldn't keep it's doors open. Bistro at Platform 8 at Town Hall Hotel became Mango. Vinayak Music and Video (with Maya Sweets) closed, as well as the Indian supplies store across the road. Fiji Market is hanging in there thankfully. Dumpling King renovated, Newtown Thai 2 became Twin Thai then closed, Thai La Ong 2 became Alice's Thai, Peasants Feast became Saigon Belle, Kin Nree Old School Thai replaced Thai Yindee. The Eagle Boys Pizza location is under renovation, due to open as Three Kings and a Queen. Bobbin and Ink sewing and screen printing is also under renovation for a cafe. For the small stretch of road there's been considerable change. Siam Rice is now Ozfuss Cafe, the Vietnamese near Stinking Bishops is now Walk Inn Thai, Poco Mexican became Talija Balkan Food, Razors Edge Bistro at the Queens Hotel became Sumalee Thai II, Artpresso became Japanese/Korean Oganoya, Vegan Mexican pop up became a cafe. Small bar RaBar is due to open as BauhausW and Hot Relish became Ballers Polpetteria. The Green Room is closing at the end of the year and Waterhorse is rumoured to be reopened by the Hartsyard gang. Work has started on the Marie Louise Salon conversion. The Kurrajong Hotel became the Swanson Hotel, a swish new spot near the dog park. Millenium Pizza Bar on Cleveland Street closed, Old School Cafe on Abercrombie became a veggie joint then became the excellent Sweeties with fresh baked sweet treats. Zattoun Grill on Redfern Street closed before we could finish a post on them. They served a great cauliflower roll. Over in the quickly morphing 'ville Gloria Jeans Coffee, Bonza Lao Thai, Blanc (froyo) and the wonderful nut and coffee shop on Illawarra Road all closed. Sushi Ya Glebe became Sandwich Hero now Sandwich Zone, Little Gobbler became Burger 10, Thai Spice, Haiphong Harbour, Mengen Kebabs and Chris Kitchen 171 closed. Bedlam Bar is now Velanzanos. Still nothing in the empty Mamak Village spot. A fire in the UniLodge student apartments saw a few places close and the food in the area is starting to recover. Broadway Tandoori in the Broadway centre closed with a new Thai joint just reopened next to it. On the main road, Hot Wheels Burgers became Nostalgia Cafe, Little Haveli became Mahek, Shalom has become Rianna's Lebanese, F & J Chinese now THE Chinese and Indo Rasa is now Thai. Asian Thai Kitchen is now Mr Lu's Rice and Noodle House. Rumah Makan Emmanuel is now Willis Canteen, the Australian/Abercrombie Hotel closed its doors while building work goes on around it, Broadway Lounge closed and is yet to reopen and Insieme Italian on Wattle Street closed. In Mascot Anadolu Pide-Pizaa and Kebabs, Mamaris Kebab House and Gloria Jeans Coffee closed. Over in Kingsford Nasi Goreng, one of the old time Indo places closed. In Kensington Rio Grande Tex Mex closed. In Ashfield, Sakura Japanese became Mokuya Sushi and Sake Bar and the very old style Chinese Sky King closed. Maria's Cakes also closed. New Tasty Dim Sim Shop closed and reopened up on Liverpool Road. In Strathfield Buldog Premium Hot Dog Bar closed. In Homebush West / Flemington, Khai's Flemington and Gumballs closed their doors. In Auburn there is a development happening on the quieter side, with the kebab store on the corner from the station and Himalayan Fusion Cafe closed as a consequence. New Orleans Cafe in Crow's Nest closed after many years, it was a favourite haunt of ours when we both worked over that side of town many moons ago. So that's all we know of, let's hope our favourites stay around for a long time. Make sure you check in on yours before they go. For me I think besides the Rent & Costs of running a business is alot of places sandwiched in between run down stores and the street's frontages are meh, I think if council's got together with owners and made the strip a destination and visually more appealing / green and clean people will come more often. Hopefully the development in Auburn will see that corner and surrounding stores/outlets either bowled over or renovated to high modern contemporary style and Cafes,Restaurants with a welcoming clean footpath. Much the same with Newtown needs a revamp badly. Great read I work in CBD and so many places along Sussex Street have closed but the good ole Viet Cafe is still there so far hehe. A solemn, plastic forked salute to the fallen of 2014. May they rest in grease. Respect. Genuinely devastated by Singapore Shiok's closure. Some of the best chicken rice Sydney had to offer. I feel guilty now for not eating from there more often, but the lure of Gumshara is always too strong on my visits to Eating World. It was a great loss, we often went there for the roast chicken hainanese rice. Tiger Cave offers some interesting dishes but it is not quite the same. So much sadness but here's to 2015 being a better one for Sydney restaurants all 'round. Happy New Year, guys! Yes indeed, cheers to all the new places waiting out there! A late entry for Aussie Inn at Pittsway Arcade at Town Hall. You guys need to try the new Do Dee Paidang (Thai rest) at Chinatown. They have the usual noodle soups and stir-fries which are good but their best offerings are in their dessert bar which IMHO as good as the one at Chat Thai if not even better. We've been there a few times, it's great. Also the one at Bondi Junction station which we love too.